Simple Steak and Veggies « think liz. 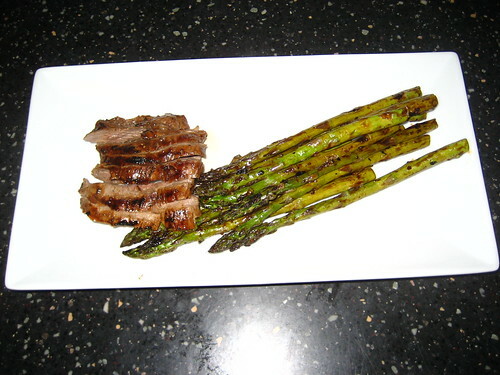 This entry was written by Elizabeth, posted on June 9, 2008 at 8:31 am, filed under Beef, Recipes, Veggies and tagged asparagus, Easy, food, grill, Quick, steak. Bookmark the permalink. Follow any comments here with the RSS feed for this post. Post a comment or leave a trackback: Trackback URL. We just tried grilling asparagus for the first time last week — it was quite tasty! I have already put this meal on our menu for this week…yum! That sounds so good! I am so looking forward to having a grill someday! Sometimes I use our little grill pan on the stove but it just isn’t the same. Yay for asparagus – I love them but Jeremy doesn’t, so I am forced to eat them all myself! I actually use this indoor/ourdoor grill most of the time because you can just put it in the dishwasher when you’re done. A lost easier than cleaning up a real grill! That, and our outdoor grill gets way to hot for my cooking abilities!